PowerCenter - Source Analyzer. Import or create source definitions. PowerCenter - Target Designer. Import or create target definitions. PowerCenter - Transformation Developer. 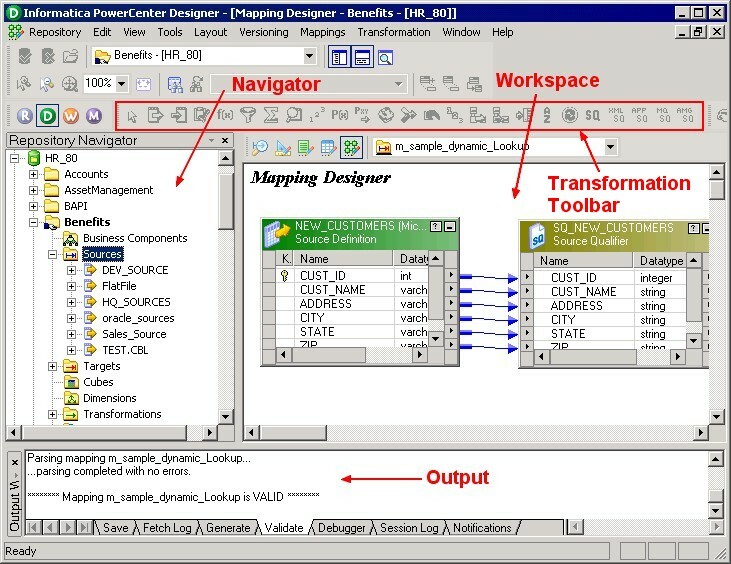 Develop transformation to use in PowerCenter - Mapping. You can also develop user-defined functions to use in expression. PowerCenter - Mapplet Designer. 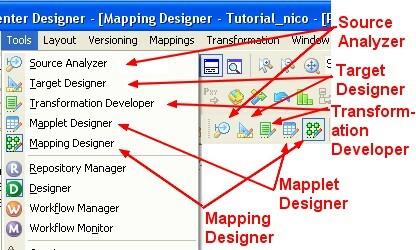 Create mapplet (sets of transformation) to use in mapping. PowerCenter - Mapping Designer. Create mapping that the integration service uses to extract, transform, and load data. Navigator. Connect to repositories, and open folders within the Navigator. You can also copy objects and create shortcuts within the Navigator. Workspace. Open different tools in this window to create and edit repository objects, such as sources, targets, mapplets, transformations, and mappings. Output. View details about tasks you perform, such as saving your work or validating a mapping.